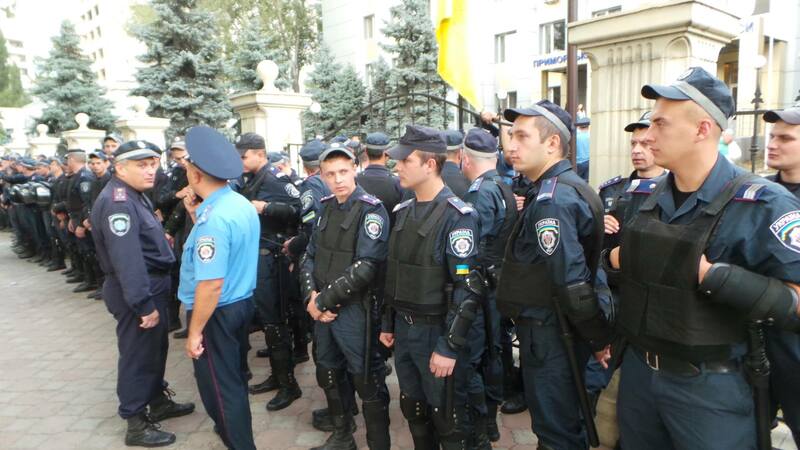 After the arrests, activists of Right Sector and Automaidan gathered in front of the seaside courthouse. Protests against the arrests, burning car tires and clashes between activists and militias were reported. Sternenko’s house was searched, after that he was arrested and taken to a unknown place. Varvara Chernoivanenko, former speaker of Right Sector Odessa says that Sternenko is at the Organized Crime Control Department. Later she posted on Facebook that Sternenko’s will stay in prison for two months. Update 21:00 UTC: The two-month prison sentence was confirmed by Bogdan Osinskij (new speaker of Right Sector Odessa) to armedpolitics. So far there is no statement from Dmytro Yarosh, the leader of Right Sector. Right Sector and Automaidan are politico-militaristic movements, they regularly challenge government institutions and officials. Automaidan Odessa was one of the first groups which openly challenged Yanukovych’s regime in Odessa in early 2014.